Classic Inca Trail to Machu Picchu 4D/3N Top! 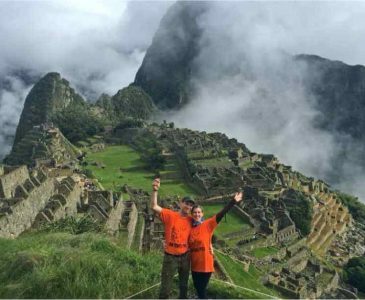 Inca Trail to Machu Picchu 2D/1N – Group Service Top! Inca Trail Machu Picchu 2D/1N – Private Service Top! Inca Trail to Machu Picchu 1 Day Top! Classic Inca Trail to Machu Picchu 2020 Cyber Special! Wilderness Salkantay Trek to Machu Picchu 4D/3N new! Wilderness Salkantay Trek + Short Inca Trail 5D/4N new! Lares Trek to Machu Picchu 4D/3N Top! Rainbow Mountain Hike 1 Day Top! Tour to Machu Picchu by Vistadome Train 1 Day Top! Tour to Machu Picchu by Vistadome Train 2D/1N Top! Complete Sacred Valley and Machu Picchu Tour 2D/1N Top! 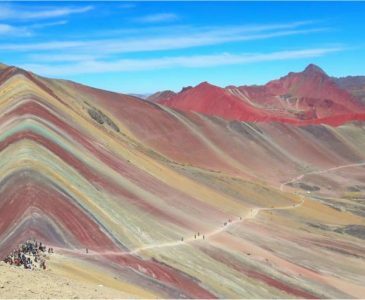 Sacred Valley + Short Inca Trail + Rainbow Mountain Tour 4D/3N Top! Full Day Complete Sacred Valley + Salt Mines Top! Complete Sacred Valley & Short Inca Trail 3D/2N Top! Cusco, Lares Trek & Short Inca Trail 7D/6N Top! Cusco, Lake Titicaca & Inca Trail to Machu Picchu 10D/9N Top! Inca Trail Trek vs. Alternative Trek? How to beat Altitude Sickness? 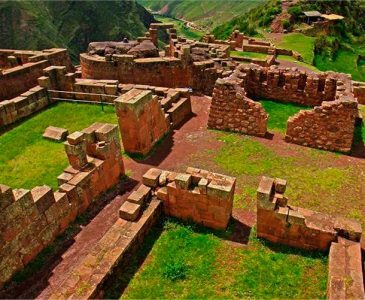 Come to the charm and beauty Cusco City, visit its archeological jewels, Cathedrals, and the architecture of the Spaniards and Incas mixed together in harmony as you aclimatize for your trek. This trek is spectacular for those travellers who wish to get off the beaten track but still join the original Inca Trail. It is a wonderful trek taking you right from the watershed of the Apurimac river to the Urubamba river and around the stunning Mount Salkantay, which is the second largest mountain in Cusco region (6,277m / 20,577ft). This spectacular trail twists and turns, ascends through high mountain ranges descends down steep escarpments passing intimately through shrewdly placed misty cloud forest. The wildest landscapes and distillation of the oldest traditions and finest building on the planet, a number of diverse ecological zones filled with an enormous variety of plants and bird life. The ancient and remote footpath passes you through archaeological sites which lead you to the ethnic and cultural exchanges of Machu Picchu itself. Then you will have the great pleasure and privilege to walk on the trail of the Incas and see the most important sacred places in South America, one of the new seven Wonders of the world: Machu Picchu. Upon your arrival in Cusco, you will be welcomed by our representative and transferred to your hotel. There you will receive a short briefing with the rest of the morning being at your leisure to rest and acclimatize. We will pick you up from your hotel in the afternoon and start to visit the Imperial Cusco City, a living example of the mix of Andean and Spanish cultures. Continuing our journey visiting the Santo Domingo Convent built over the Koricancha, as well as the ancient Inca Palace and the main worship centre of the Sun God. You will have time to enjoy these beautiful sights; proceeding to visit the archaeological site of Sacsayhuaman with its military Inca architecture which dominates the city. Finally we go to the north east of the city to the archaeological sites of Qenqo, Pucapucara and Tambomachay. Afterwards we take you back to your hotel in early evening for a rest then you will experience Cusco by night in one of the many terrific restaurants surrounding the main square or Plaza de Armas. At 5am we pick you up at your hotel to open your senses to discovery and adventure, driving 3.5 hours to Soraypampa. Along the way you can enjoy views from the sea of humanity of villages: Iscuchaca and Limatambo, stunning verdant valleys and the snow-capped mountain Salkantay. At the trailhead (Soraypampa) we have our breakfast enjoying the legendary views of Humantay (5900mt) and Salkantay (6217mt) Mountain glaciers. We take a 2.5 hour round hike up to see the turquoise Umantay Lake afterwards we gently ascend to Salkantaypampa where we will camp. Then enjoy your afternoon tea time with coffee and hot chocolate. The views on this day will be truly breathtaking. Meals: Breakfast, Lunch, Afternoon Tea Time & Dinner. Arising with the birds we travel independently off the beaten track for about 3 hours uphill. We stop to take lunch along the way and continue our trek for 3 more hours to reach our campsite which is approximately 1km away from the sharp icy topped peak mount Salkantay looming above the rest dominating it´s domain. On the way we will enjoy the bandaid of surrounding snow-capped mountains, glacial prehistoric lakes and the depths of amazing valleys. Upon arrival we have high tea and hot toddy at the camp. Meals: Breakfast, Lunch, Tea Time & Dinner. At our half way point of our trek our day begins with a slow challenging 4 hour ascension to reach the Incachiriaska Pass (4,880m) which translates to ‘the place where the Inca cools down’. Tracing through this area, in the rocky crags, lives the Andean Condor the massive bird who floats around in the mists above the Andes. Our trail plateaus and descends into the blanket of a safety to reach our campsite for the night at Sisaypampa. Meals: Breakfast, Lunch, High Tea & Dinner. After a delicious breakfast we start hiking to the end of the valley, which then enters a wider valley Pampacahua. There we find an Inca canal that is still in full use by the local farming settlements. At the end of the Pampa we find our first Inca archaeological site Paucarcancha that we pass on and arrive at Wayllabamba for lunch walking for 3 more hours through the Llullucha Valley to reach our campsite at Llulluchapampa where we enjoy our high tea embracing the great views. Early in the morning we take our breakfast and start our climb for about 2 hours following an original Inca stone path and trek up to the Warmiwañusqa Pass (4,217m/14,047ft) where we have a magnificent view of our ascent and the trail ahead of us. We descend on a reconstructed Inca Trail down to the Pacaymayu River where we have lunch and walk uphill for 2 more hours towards Runcurakay Pass (3,977m/13,127ft); from here we enjoy the breathtaking views of all the surrounding mountains. Then we descend for 3 more hours to Phuyupatamarca (3,650m/12,047ft), where we spend the night. Today is the most beautiful day of our trek. We have our breakfast early in the morning enjoying the sun rise, Urubamba Canyon, Machu Picchu Mountain and the stunning Inca sites. After we descend for 2 hours through the cloud forest to Wiñaywayna for lunch, walking for 1 hour to the Sun Gate; from here you can enjoy your first breathtaking view of Machu Picchu and all the surrounding mountains. Afterwards we descend to the citadel and take our shuttle to Aguas Calientes where we spend the night in a hotel. Wake up early to rise to a new day of adventure and mindfulness sharing the day with our majestic Machu Picchu. Following in the ancient and remote footsteps of the ‘Lost City of the Incas’. Listen carefully to the etheric cultural exchange of history without the crowds who arrive at midday. You will be gifted with free time to explore, take photos, climb Huaynapicchu or visit the Sun Gate. After, we go to Aguas Calientes and in the afternoon at either 4:43pm or 5:27pm we return by the Vistadome train to Poroy (Cusco) where we take you back in our private van to your hotel in Cusco around 8:45 pm or so. After having breakfast at the hotel, enjoy your remaining time in Puno City, then in the late morning or afternoon we will drop off at the airport in Juliaca to take your plane back to Lima or bus station in Puno. OPTIONAL UPGRADES for hotels to 4**** or more! ***This unique trekking package of the Lares Trek and Short Inca Trail can leave on any date, as long as we have a minimum of 2 participants. ***This price includes the extra porter who will carry your belongings up to 7 kgs, we provide you a duffle bag, you can put your things. ***We provide large Eureka 4 man tents for each 2 trekkers. ***All entrance fees are included and we operate our tours in small groups averaging 5 persons with a maximum of 8! Students with ISIC CARD: US$25. Please send us a copy of your ISIC card at the time of booking. Under 18 years old: US$30. Please send us a copy of the passport at the time of booking. Upgrade to 4 or 5 star hotels. Duffle Bag and Trash Bags – included in the trekking price! Extra Porter is included in the price, the porter will carry your belongings up to 7 kgs /14p like sleeping bag, mattress, clothes etc. Boiled Water is included along the Inca Trail. Emergency Horse is included in the price which can be riden if you get tired or sick. Plastic Rain Poncho made by SAM Travel Peru is included. SAM (initials of Saul Alvarez Montalvo) Travel Peru is a family owned travel agency and direct local tour operator based in Cusco with personal experience over many years of trekking. SAM Travel Peru is a 1oo% Cusquenian Company without any shareholders. My dream as the owner was to create small personalized tours & treks strictly and only operated by local professional staff catering in PERSONALIZED and HIGH QUALITY SERVICE. We take pride in having a reputation as being a RESPONSIBLE & SUSTAINABLE tour operator. My staff are my extended family. I ensure they are supported financially by paying them a good wage. I am proud of my team without them I couldn’t give the best service and lifetime experiences to our clients. In an effort to provide a more personalized service to our passengers, we in SAM Travel Peru have a policy that our groups will not exceed 8 people. This fact alone sets us apart from other companies that operate departures with bigger groups. I am very proud of my guides! Highly professional, speaking in fluent English and very knowledgeable. Passionate for the Inca heritage/ history, dedicated to a steady personal development and learning to ensure that you receive accurate and recognized theories about the Inca Andean culture. Fun loving, great sportsmen and well educated some having a degree in Archaeology, Botany, History or Anthropology. Others are great entertainers and the best “Salsa Dancers” on this side of Machu Picchu. What a luxury to take a hot shower after 3 days of long hiking at Wiñaywayna the third camp site on the Inca Trail! Then enjoy the guided tour of this beautiful Inca City of Wiñawayna afterwards taking time to explore on your own later. For SAM Travel Peru little things make a big difference. OUR TENTS: Enjoy a good night sleep in our 4 season EUREKA Timberline tents. All our tents are 4 man tents, ONLY 2 will sleep in them, leaving lots of room to spread out comfortably and store your duffel bags. They also include a little vestibule in front, giving you some extra outdoor space to leave your boots and walking sticks so you don’t have to bring in dirt. OUR THICK FOAM MATTS: They are included to separate and insulate you from the ground. Additional AIR MATTRESSES can be rented for US$20. OUR KITCHEN & DINING TENTS: The dining tent is used as our meeting room at meal times. This is a great time to sit back relax and catch up for a chat. OUR TABLES & CHAIRS: The interior of the dining room includes tables and chairs with two doors on each side, adapting to the day’s weather. DUFFLE BAGS: Will be provided at briefing time the night before the trek. MORE: Pillows, backpack, rain covers, survivor t-shirts, hot shower and bio chemical toilet are all provided on the trek. SAM Travel Peru has always believed that we should “give back” to the communities we pass through on our treks. Therefore, as part of our commitment in responsible tourism, we socially support and employee from these communities. SAM Travel Peru is proud to be able to support these beautiful people, not only in hiring them for work but to bring things back to grassroots, to share in their home and families. This makes us happy to have a holistic approach with our highland employees and their families! A beautiful reflection of our attitude in everything we do, is that we wish to make life richer and more meaningful for all involved. You will be welcomed at Cusco airport and taken to your hotel, please ensure that you inform us of your full flight details at least 14 days prior to your trek. Look out for our representative holding an orange board SAM Travel Peru at the arrival terminal. You must exit the terminal in order to find our representative (they cannot enter inside) It can be done on any date that is best suited to you! It will take place the night before the trekking departure at 6pm in our office which is located at Calle Santa Teresa Nº383 ; 303 (second floor), we are next to SUBWAY restaurant. CAN I STORE MY LUGGAGE AT YOUR OFFICE? Of course! During your tour or trek your main luggage can be store at our office or at your hotel, both are for free. Please don´t pack anything you will need for your hike. FIRST, to book your Salkantay Inca Trail package, we need you to fill out our booking form by clicking on BOOK NOW on our homepage or click here the link BOOK NOW. SECOND, we require a deposit of US$200.00 per person in order to purchase a permit for the Classic Inca Trail Machu Picchu. You can make you deposit by clicking on the VISA or PAYPAL symbols on the top of our home page, or you can click on the VISA or PAYPAL symbols on our booking page or click here on the payment of your choice, either VISA or PAYPAL. It would be greatly appreciated if you pay in cash at our office (US dollars or Peruvian soles) here in Cusco. We have many cash machines in the historical center to withdraw money. You can also pay by VISA or PAYPAL online but you will have to pay a 5.5% service charge, charged by VISA and PAYPAL. To pay your balance through PAYPAL, you need to log into your PAYPAL account using our email address of samtravelperu@gmail.com. HOW DO I QUALIFY FOR THE STUDENT DISCOUNT? 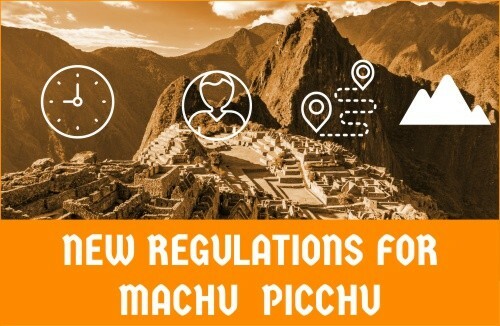 According to Peruvian Law you must be under 18 years of age at the time of your trek, tour, or visit to Machu Picchu (students 18 & above need ISIC cards). For example if you book a trek at the age of 17 but you turn 18 before you do your trek, you do not qualify for a student discount. All students from 12 to 17 years, the discount is $40. For childre from the age of 2 to 12 the discount is $60. For children from the age of 0 to 2 are free. All students must provide a copy of their passport at the time of their booking to get the student discount. HOW DO I GET THE STUDENT ISIC CARD DISCOUNT? The ISIC Student Discount is US$25. You must have a valid current internationally accepted ISIC card in your name. You must provide a copy of your ISIC card at the time of your booking. MAY I CHANGE THE DEPARTURE DATE AFTER THE TICKETS HAVE BEEN BOUGHT? Unfortunately the answer is “No”. Once the tickets have been bought the government does not allow any changes, so we can’t change any departure date after the ticket has been bought. Tickets are also not transferable nor refundable. *** If you cancel your Salkantay Inca Trail package, the deposit is not refundable at all! DO I NEED MY ORIGINAL PASSPORT? Yes for sure! You have to bring your original passport and it is very important that it is the same passport number you sent to us to book your package for classic Inca Trail Machu Picchu permit, entrances & other reservations. The rangers will check every day and when you enter Machu Picchu. The train company will also check your passport before allowing you to board the train. In case you are renewing your passport, go ahead and send us your old number to secure your permit, and we can change it when you get your new passport number…if so, please send the new passport number as soon as possible. First I would say that the weather is very unpredictable and it’s difficult to foresee. BUT you will have many different varieties of weather as you pass through the numerous microclimates and will depend on the location. We highly recommend you to bring some warm clothes and good rain gear in your day backpack. It is helpful to dress in layers. In general if you have regular exercise and spend a couple of days in Cusco, or in the Sacred Valley for acclimatisation to the altitude, you may be fine. The recommended medicine for altitude sickness is WATER, COCA TEA and OXYGEN IF NEEDED; our guides are trained to treat you for Altitude Sickness. See our detailed information about Altitude Sickness under FAQS. We offer the Cusco City Tour or Sacred Valley Tour that you can book while you are acclimatizing. Check out our Day Tours on our Home Page. HOW MANY PEOPLE ARE THERE PER GROUP? HOW MANY COOKS/PORTERS FOR THE GROUP? You will have 1 cook per group. The number of porters depends of the size of the group. For a group of 2 trekkers, there will have 4 porters, 4 trekkers will have 6 porters, 6 trekkers will have 9 porters, 8 trekkers will have 12 porters. The evening before you start your Classic Inca Trail Machu Picchu trek, you will be given a SMALL DUFFLE BAG to pack your clothes for the next four days. Your weight allowance is up to 7kg/15lbs. Your team of porters will carry your duffle bag for you, together with the food and camping gear. It’s important to be aware that you will not have access to your items in the duffle bag until the end of each day, as the porters will always be ahead of the group. During the trek, you need a day backpack big enough to carry your personal belongings such as a warm jacket, a rain jacket, your camera, sunscreen, snacks, water, etc. Usually a 30 to 50 litre backpack is sufficient. IS THE TREK DIFFICULT, DO I NEED TO BE FIT? The Salkantay Classic Inca Trail Machu Picchu is about 42km (24.4 mile) hike through the Andes in the Cusco region. The maximum altitude reached is 4,217m/13,907ft. On the second day of the trek we climb two mountains. The Trail is a fairly difficult trek and you should be well prepared and healthy prior to starting it. You have to be moderately fit and take regular exercise. In preparation: try walking 15kms in a day or go to the fitness club in the months leading up to the trek. It is also important to be well acclimatised to the altitude. Try to spend at least 2 or 3 days in Cusco (3350m/11,047ft) prior to starting the trek. WHAT ABOUT TOILETS ON THE TREK? It has been highlighted by most of our clients, especially by the female ones who want a private, clean and sanitary toilet!! SAM Travel Peru toilet facilities have an individual tent and a “camping toilet with a seat.” Check out the picture, which illustrates how we set up our camping toilet on the trek by using this link: picture of toilet tent. Our toilet is always set up a comfortable distance from our campsite. At night if you need to use the toilet it is readily accessible and clean, unlike the dirty facilities supplied by the government. WHAT HAPPENS IF I AM UNABLE TO FINISH THE TRAIL? 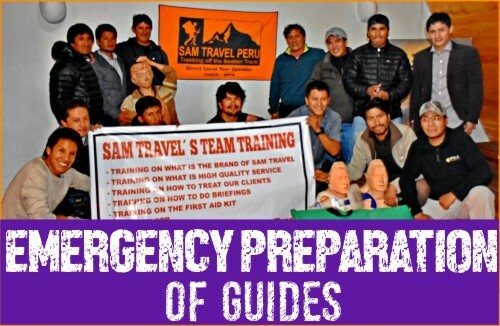 In the scenario that you are unable to finish the trek due to a health reasons, Sam Travel Peru will assist you to the nearest town for help with transportation. We always carry oxygen on the trek for any respiratory problems. In extreme cases, a helicopter pick up can be arranged at your own expense. (Travel insurance required). There are no refunds in the unlikely situation that you are unable to finish the trek. Generally those who have to be assisted off the trail are taken to Ollantaytambo and if they recover quickly they continue the journey to Aguas Calientes (cost incurred by trekker) and visit Machu Picchu according to the original plan. ARE WE DROPPED AT OUR HOTEL? Absolutely! Included in our packages is dropping you off at your hotel on the return from your trek or tour. If you have booked your hotel in the Sacred Valley like Ollantaytambo or Urubamba, we will drop you there too! If you spend the night at Ollantaytambo before the trek, we wil pick you up there. AT WHAT TIME IS THE TRAIN’S DEPARTURE? If you’re happy with the services provided, a tip – though not compulsory – is appropriate. While it may not be customary to you, it’s of great significance for the people who will take care of you during the trek. It inspires excellent service and is an entrenched feature of the tourism industry across many SAM Travel Peru destinations. Of course you are free to tip more or less as you feel, depending on your perception of the quality and the length of your trip. Remember, a tip is not compulsory and should only be given when you receive excellent service. Yes,we are a local sustainable & responsible tourism operator in that we incorporate the universal principles of tourism: protect the environment and benefit the local communities respecting their culture and religion. With this in mind, we have trained all our staff to know, understand and respect the local places and it´s people. Would you like to be called by a travel sales specialists, if so please fill in your phone number? If you are booking the Inca Trail 1,2,4 or 5 days, we need you to send a copy of your passport to SAM Travel. Please give at least two alternative start dates for your trek or tour in order of preference. For how many persons are you currently booking? Is anyone in your group 17 or under? B. Machu Picchu Mountain (with an Inca Trail hike it is $70 per person/$30 per person with other Machu Picchu tours and alternative treks)? "Only one hike is possible per day because of lack of time"
Our tours include Tourist Class Train (Expedition Service) - Would you like to upgrade to the Vistadome Train. (US$57 extra per person)? What type of room do you need? Please add any additional information you think Sam Travel needs to know for your booking. If you have already booked your hotel in Cusco, can you please provide the name and address of hotel for pick up? How did you hear about SAM Travel Peru? By checking the box, you have read the "terms & conditions" of SAM Travel Peru and you are in agreement with SAM Travel Peru's Terms & Conditions. WHAT YOU HAVE TO TAKE WITH YOU? Water storage: 2-3 litre Camelbaks are encouraged. As a Professional Direct Local Tour operator we provide you with a duffle bag at your briefing and INCLUDE an extra porter who will carry up to 7 kgs or 14 pounds including your 2.5kg sleeping bag, mattress and extra clothing. Warm clothes, down jacket — 2nd campsite temp around 3º Celcious. Quickdry towel. We provide small ones, you might prefer something larger. Small bottle of soap: we provide warm water each day to wash.
Large plastic bags will be provided at the office — Please ask for them. Sleeping bag: It has to be at least -15ºC – This can be rented from us for US$20. First aid kit: band aids, moleskin, etc. We highly recommend a small backpack 30 to 40Litres for hiking in the day. A big backpack will not be allowed into Machu Picchu. The remainder of your belongings will be in your duffel bag at camp. Water: Please supply your own water until the first lunch spot, then we will provide you with cold boiled water at every meal time. Please bring your canteens. Machu Picchu was recognized as a World Heritage site by UNESCO in 1983. UNESCO has been concerned with the increase of visitors to Machu Picchu within the last few years and worries that these crowds are causing damage. They have established new regulations for 2019 to reduce visitor traffic within this archaeological complex. These new regulations will take effect on January 1, 2019. All visitors will now be limited to 4 hour visiting sessions. Tickets to Machu Picchu will be divided into three daily sessions: early morning (6AM – 9AM), late morning (9AM – 12PM) and early afternoon (12PM – 3PM). Within these sessions, visitors must choose a specific hour to visit. This is to regulate and reduce visitor traffic within the citadel– each hour will be limited to 600 visitors. These are new regulations that will take effect starting January of 2019, keep visiting our page and social sites for more information or updates on these regulations.